﻿ What's the Best Pallet Rack for Your Application? Blog Home > Inventory Management > What’s the Best Pallet Rack for Your Application? What’s the Best Pallet Rack for Your Application? When approaching pallet rack choices, cost, storage density and construction elements all play a role in making a choice. While cost is always a prime concern, be mindful that cost is often tied to storage density. Cheaper pallet rack tends to not have as much storage density as more expensive rack. But before you consider cost, you must decide what applications you will use the pallet rack for. How the pallet rack is built greatly determines how it can be used. 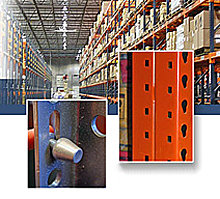 Selective pallet rack is most frequently selected due to lower cost, and consists of roll-formed steel which connects using tear-drop shaped connectors. These style connectors make installation and changing beam levels fairly easy as the uprights have tear-drop shaped receptors and the beams have round ‘buttons’ which slide into the tear-drops to securely connect beams to the uprights. This easy connecting method means that rack can be easily reconfigured, dismantled and reused as storage needs change. Structural pallet rack is much like selective rack with the exception that the uprights and beams are bolted together, leading to a much increased load capacity. The rack can be reconfigured, relocated, and dismantled to fit storage needs, just not as quickly. One especially significant feature of structural pallet rack is that the uprights can replace structural support I-beams during construction of the building, creating a pallet rack supported building. Seismic pallet rack is a specially rated rack with larger base plates for sturdier anchoring and greater stability during seismic activity. Construction requirements generally lean toward heavier beam capacities for improved structural stability. This type pallet rack is required by local code in certain locations around the world where seismic activity is frequent or violent in nature. 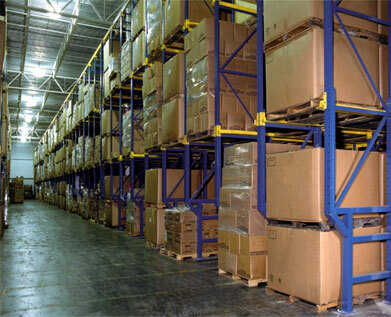 When it comes to high density storage, there are a wide variety of pallet storage racks available. In the table below find those types listed along with their style characteristics for a fast way to determine which you might want to consider. Provides easy access at all times since it is only two bays deep and accessible from both sides. Many more aisles, less dense storage. Allows entry of forklift into pallet bays for pallet retrieval in deep racking. Rack is open on only one end. Allows entry of forklift into pallet bays for pallet retrieval in deep racking. Rack is open on both ends. Rack depth up to 6 pallets deep. Pallets are stored on wheeled carts that run on rails with slight angle toward front face of rack. Pallets flow to front edge by gravity. To add new pallets, the forklift pushes existing end pallet forward and places new pallet on available cart now exposed. Pallet rack has roller rails with a slight forward pitch that pallets sit on. As pallets are removed, the remaining pallets flow forward. When pallets are added, the existing pallets are pushed back to accept the new pallets onto the rail. Racks are built on a railed carrier system which collapses the aisle space between rows of racking to conserve overall space and allow greater pallet density. Aisles are opened as forklifts need access to various aisles. With pallet rack, it all comes down to storage density and access. Your ultimate decision on rack selection will be determined by how dense you want your storage capacity to be for optimum use of the warehouse cube, and how forklifts will access the product within that rack – First-in last-out, last-in first-out, always accessible, or limited access at times. For additional information on rack density, see Selective vs. Storage Density. Also, if you need to know more about seismic zones and pallet rack selection, please see Seismic Zones & Pallet Rack.